Volunteers are the lifeblood of Skyline Ridge Neighbors. We are entirely run by volunteers from our neighborhood. Needless to say, we could not function without the hard work and dedication of our volunteers! Lots of volunteers are needed every year to help set up and operate our annual neighborhood party and fundraiser. To learn about how to volunteer, contact volunteer@srnpdx.org. SRN needs dedicated volunteers to serve on the Board of Directors. Board members are elected by the members each spring for 1 or 2 year terms. The Board meets once per month and manages the affairs of the organization. For more information, contact president@srnpdx.org. You can help keep the neighborhood up to date with the latest information by becoming a regular reporter for the Newsline. If you have a particular area of interest, you can volunteer to send info to the Newsline about events and programs of other local organizations. For more info, contact the Newsline editor at newsline@srnpdx.org. Like the Newsline, the SRN website also uses volunteers to add new content and keep the information accurate, up to date and useful. Anyone with basic or advanced computer skills is welcome. Contact the Webmaster at webmaster@srnpdx.org. This is a joint effort of Skyline Ridge Neighbors (SRN), Forest Park Neighborhood Association (FPNA) and Skyline Grange. The success of controlling the spread of garlic mustard requires all of us. Every year on the Saturday after Earth Day, SRN sponsors a neighborhood clean-up through SOLVE, a local nonprofit charity. 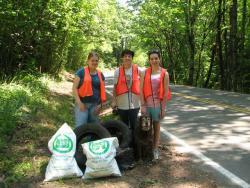 Help make our rural roads safer and cleaner by spending a few hours picking up trash along with other volunteers. Watch for information in the April Ridge Runner about the date for this year’s SOLVE clean-up. The Skyline Grange is one of the few places in our neighborhood where SRN and other organization can hold educational events for the neighborhood. Skyline Grange needs volunteers to help with its social and fundraising events such as the garage sale, plant sale and community dinners. For info, contact skylinegrange894@msn.com.